We think a lot about old skills, renewable resources, making do with what we have and being creative. 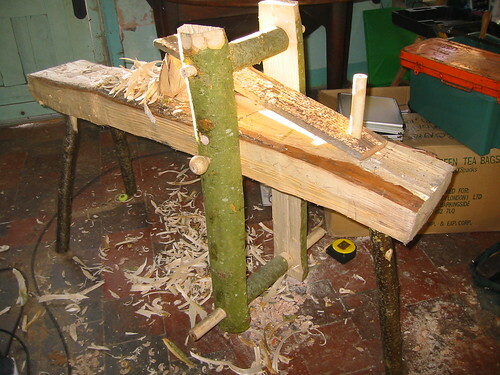 Over the winter break Paul progressed with some of the projects he's planned for green woodworking. I don't often write about this because it's something he does and mostly I don't, except when a bit of weight comes in handy to hold something steady but he did a lot over the holiday and I took some pictures recording it. In the picture above you can see some of the tools of the trade. There is a froe, a side axe and a billhook. There is also a hand made wooden mallet, shaped from a single piece of wood, and a book. No one is born knowing these old skills and in the absence of a master, the only way to learn the craft is from knowledge recorded by others. Paul's been working using Mike Abbott's Green Woodwork which is pretty much the standard primer for all new woodworkers. One of the things he's been working on is this shaving horse. 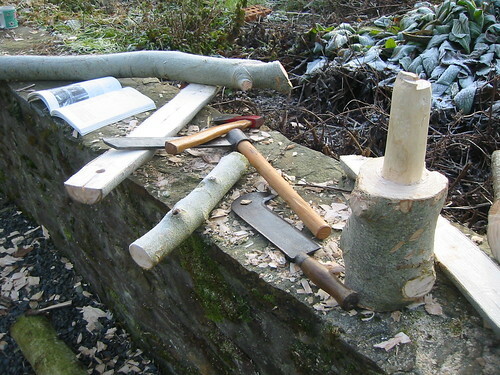 Apart from the use of a chainsaw to cut the trunk of the Ash tree that provided the wood, all the work has been done with hand tools in a traditional manner. The main beam of wood was split from the log with the aid of an axe, wedges and a sledgehammer. The shaping has been done with a side axe, the bill hook and various wood chisels. The shave horse isn't very exciting in itself but it is an essential tool for preparing wood for turning on the pole lathe. Most of the work was carried out in the freezing cold. In this last picture you can see the pole lathe in the shelter of the tractor shed. On it, Paul turned the pins that hold the shave horse together, which is a bit confusing really because he could have done with the horse to prepare the wood for the lathe. 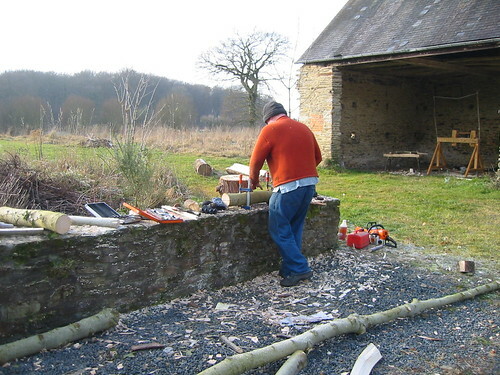 Now, we have nearly everything we need to start working green wood into useful items. We have apple, cherry and box woods on the farm which will make all sorts of furniture and kitchen tools. My dream is to be able to turn bowls but it's extremely skilled work and I'm not actually able to turn a rolling pin yet! I always think it's amazing what can be produced with wood. Someone I know made a bench out of aged driftwood and I would have killed to buy it off him. I imagine as the wood has been floating in the salty sea for so long it would never rot or need treatment. I'd be very interested to see what you make. Joker, your lady sounds just like the right sort. I bet she knows a lot more than we do. Tree line, your website looks very interesting but I'm going to remove your comment because I believe it is advertising. Fuzzlewoof, driftwood things are marvellous and as you say, very hard and durable. Green wood is different because unless you handle it carefully it will split and break as it seasons. Some of our first projects will boring things like fence posts and hurdles. Not terribly beautiful but they should help control those pesky deer.